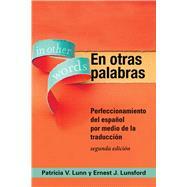 by Lunn, Patricia V.; Lunsford, Ernest J. Students of advanced Spanish share a desire to use and understand the language, even as their backgrounds and goals for the language may vary widely. En otras palabras provides advanced learners of Spanish with hands-on manipulation of grammatical, lexical, and cultural detail through the practice of translation ( traducción). This challenging and enjoyable textbook'now in its second edition with up-to-date texts on current events, new exercises, and new and expanded instructions -- presents students with incisive grammar explanation, relevant lexical information, and a wide variety of translation texts and exercises in order to increase their mastery of the Spanish language. En otras palabras contains Spanish texts to be translated into English as well as English texts for translation into Spanish. Translating into English requires students to understand every detail of the Spanish text and decide how these details might best be expressed in English. Translating into Spanish requires students to recognize how Spanish structures and words do -- and do not -- parallel those of English. Both activities provide advanced students of Spanish with an invigorating linguistic workout and serve as an effective introduction to the practice of translation. Translation is a cultural as well as a linguistic activity; for students, learning how to translate provides invaluable experience of the inseparability of language and culture. En otras palabras addresses the errors made by advanced learners of Spanish while involving students in the pleasurable, problem-solving process of translation. This second edition contains a wide variety of usage-based exercises for both individual and group work. Concise and complete texts feature narrative and description, marketing and publicity materials, medical and legal topics, sports journalism, and internet posts. En otras palabras is designed for a three-credit semester class; an online Instructor's Manual is provided at no charge to professors who adopt the text in their classrooms.